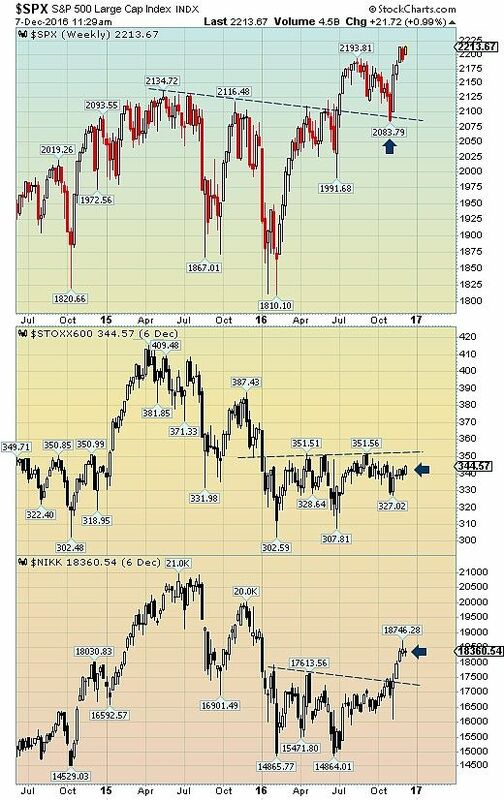 The benchmark for world markets, the Dow Jones Global Index (DJW), has successfully broken out in Q3, tested the support level of 311 and rebounded. The expectation is now for a retest of the 2016 high of 328.63 over the next few weeks and then a challenge for a new high in Q1. 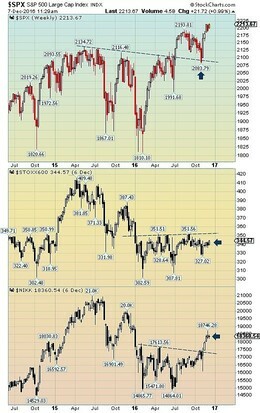 Supportive strength is coming from many indexes. The S&P 500, after a similar price movement as the DJW, rebounded from the 2083 mark and then posted a new all-time high. Europe's STOXX 600 is recovering at a slower pace. 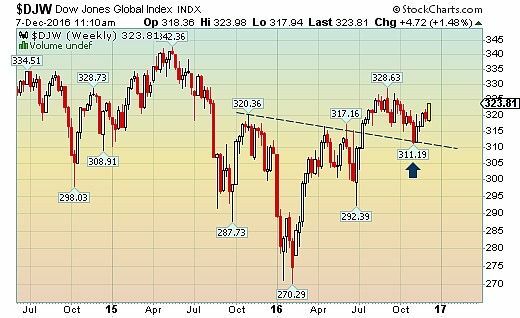 The index for the second largest world economy appears set to retest the 351 barrier for the fourth time by the close of 2016. We suspect more time maybe needed before a prolonged advance can form. Many Asian markets are also recovering from the lows in early 2016. China's Shanghai marked a 2016 high in late November at 3301.21, India's BSE posted a high in mid-year and Japan's Nikkei surged to a 12-month elevation at 18,746.28 in Q4. Bottom line: The Dow Jones World Index (DJW) is slowly advancing. After testing support at 311, the benchmark index has continued to strengthen and is expected to achieve a new high in Q1. Improving economic conditions for the U.S., Europe and Asia continue to underpin the DJW. We anticipate this driver for world indexes will continue to be favourable into early 2017.